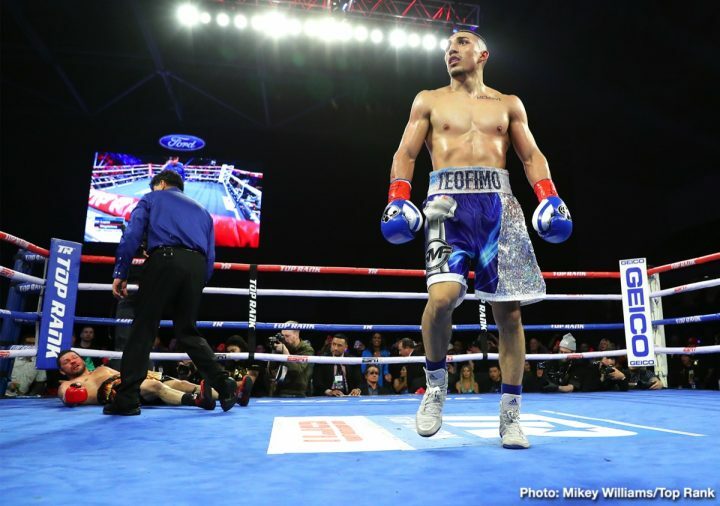 By Aragon Garcia: Undefeated lightweight Teofimo Lopez stole the show last Saturday night in knocking out Diego Magdaleno in the 7th round on ESPN+ at The Star in Frisco, Texas. The young 21-year-old Lopez (12-0, 10 KOs), who Top Rank Boxing are looking to turn into their next star, flattened Magdaleno (31-3, 13 KOs) after hitting him with two huge left hooks in the 7th round. The beginning of the end for Magdaleno came late in the 6th round, when Lopez hurt him with a left to the head that dropped him. Lopez didn’t go all out to finish the job in the round. In the 7th, Lopez calmly finished the job by throwing two leaping left hooks that knocked Magdaleno out. We may be seeing the new Floyd Mayweather Jr. with Teofimo Lopez’s coming party last night. Lopez is the closest thing to Mayweather the sport has seen, but he’s a better version due to his punching power, which is out of his world. While the referee Gregorio Alvarez was giving a count to Magdaleno, Lopez did a back flip, and then walked over taunted his beaten opponent. The fight was stopped at 1:08 of round 7. It was a very good performance by Lopez. His celebrating at the end of the fight wasn’t the best decision he could have made given Magdaleno’s condition at the time. You can argue strongly that here shouldn’t have been a count. When a fighter is as hurt as Magdaleno was, the referee should be stopping the fight, especially when the contest is as one-sided as last night’s Lopez-Magdaleno fight. Lopez is calling his emergence at lightweight as the “takeover”, and he plans on collecting the scalps of the top guys, be it Vasyl Lomachenko, Richard Commey or Mikey Garcia. Lopez’s goal is to own the lightweight division. The way that he looked last night, there doesn’t appear to be anyone that can stop him. Lomachenko’s time as a champion might be coming to an end. Top Rank will need to decide whether they want to let Lopez get at Lomachenko, who Bob Arum has been comparing to Muhammad Ali. It would look bad if Lopez upends Lomachenko so quickly after Arum’s Ali comparisons. It’s never a good idea for a promoter to get carried away with building up a fighter before he’s even fought the best guy in his own stable. Lomachenko is an excellent fighter, but he’s going to have problems when he gets inside the ring with Lopez. That fight is going to be easily the toughest of Lomachenko’s career, because he’s be facing the youngest, biggest and the most powerful guy that he’s faced as a pro. Lomachenko likes to stand in front of his opponents throwing pitty-pat shots. That style isn’t going to work for Lomachenko against a knockout artist like Lopez. It could get Loma hurt if he fights like that against Lopez. Immediately after the fight, Lopez (12-0, 10 KOs) made it clear that he’s going to win a world title in 2019. Lopez, 21, didn’t say who he’ll beat to capture the 135 lb belt, but it appears he’s counting on his promoters at Top Rank Boxing to schedule a title shot against WBA/WBO lightweight champion Vasyl Lomachenko (12-1, 9 KOs), who will shortly be fighting newly crowned IBF champion Richard Commey on April 12 in a unification fight. If Lomachenko wins that fight, he’ll have the IBF, WBA and WBO lightweight titles. Only the WBC belt will out of his grasp. Teofimo is ranked #11 with the World Boxing Council at this time, which means he’s not likely going to get a shot at the WBC lightweight belt anytime soon. That leaves only Lomachenko as Lopez’s best option to fight for a title in 2019, if Top Rank is going to accommodate their young 21-year-old star by letting him fight for a strap. If Top Rank decides to slow Lopez’s progress to a title shot, they would arguably be doing Lomachenko a tremendous favor, considering he’s not likely going to be able to stand up to the size, one-punch power, youth and the Mayweather-like skills of Lopez. If the Lomachenko-Lopez fight takes place, it’ll be a size and power mismatch. Lomachenko has no business fighting light welterweight-sized lightweights like Lopez, especially given the power that the New Yorker has with both hands. When you throw in Lopez’s Mayweather-like boxing skills, it’s just bad news for Lomachenko anyway you want to twist it. If Lomachenko is going to be trying to unify the lightweight division, then he’s going to have to be able to deal with Lopez for him to earn that spot. Top Rank can’t protect Lomachenko from Lopez. Assuming Lomachenko wants to be considered the best fighter at 135, then that means he’s going to need to take on the top guys to earn the honor of being seen as the best. That means Lomachenko will need to beat Lopez, and right now there are a lot of doubts that he’s going to be able to do that. “I learned something new. We learned there are going to be tough fighters,” Lopez said. “I didn’t have to throw every second. We were picking our shots. Every time I picked I landed. He wanted to go toe to toe. No, we’re going to be smart about it. I felt like a champ. That’s how I feel,” Lopez said. Lopez probably could have finished off Magdaleno much earlier in the fight if he’d thrown more punches, but he seemed to be more interested in boxing and looking for the perfect shot to connect with rather than steamrolling the 32-year-old the Nevada native to get him out of there in the first two rounds. Magdaleno got off on the wrong foot with Lopez after the 1st round ended. He tried to get into Lopez’s head by getting in his face and trash talking him after the round had ended. This didn’t help things for him, as it energized Lopez, causing him to unload on the 32-year-old Magdaleno with hard shots throughout the round. You’ve to give Magdaleno full credit for being able to take the big punches that Lopez was hitting him with, because he’d never been hit like that during his career. Magdaleno was ready to take the shots, but he wasn’t going to be able to take a lot of them for a full fight. Late in the 2nd, Lopez landed a hard right uppercut that hurt Magdaleno and cut him on the bridge of his nose. Magdaleno took the shots, and made it to the head of the round, but he looked in bad shape. Had Lopez continued to pour it on at the same rate in the third round, he very likely would have knocked Magdaleno out. Lopez landed 119 of 329 punches for a connect percentage of 36, according to CompuBox’ stats. Magdaleno landed 44 of 259 shots for a 17% connect rate. Lopez’s defense was almost impregnable. He had the Floyd Mayweather Jr. stance going last night night, and he wasn’t letting anything get through. All the sparring that the young 21-year-old Lopez has been doing with top fighters since he turned pro has turned him into another Mayweather, but one with one-punch power. At 5’8″, Lopez is HUGE for the lightweight division, and the combination of his punching power and his Mayweather-esque boxing skills makes him a nightmare for anyone in the division right now.